Like a lot of things I encounter surfing “the InterWebs” these days, I have a serious love/hate relationship with YouTube. The positive value is fantastic. The negative skank factor is a huge turn-off, and frankly… almost impossible to turn off. Even when you visit a video with redeeming value, there’s inevitably some goofball from Peoria using the comments section to demonstrate via effusive expletive his lack of expressive verbal power. So dumb. So unnecessary. And let’s not forget the video response spams enticing the viewer to explore skanky content, and the “related” videos on the side, in case there wasn’t enough skank elsewhere on the page. Enter quietube (www.quietube.com). The concept (and the execution) is brain-dead simple. Go to the page. Here’s what you’ll see. 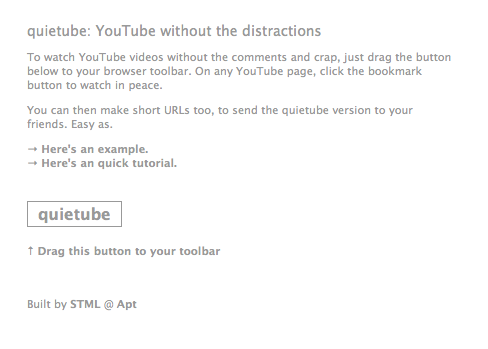 Drag the little box that says “quietube” to the bookmark toolbar in your browser. The next time you are looking for something on YouTube, as soon as you find it, just click the “quietube” button in your bookmark toolbar, and you’ll be taken to the same video on the quietube site, where you’ll see… (drumroll please) … just the video. No comments. No video responses. No skank. You can then copy the URL of this quietube version of the video and email that link to friends and family, knowing that you are providing them with some cool and/or valuable entertainment without thrusting them into a skanky Internet back alley. You need to understand that this isn’t a YouTube replacement. You can’t go to quietube and surf YouTube from there. But you can at least watch without undesirable garbage, and send links to YouTube videos with greater safety. As an example, I present to you, one of my favorite viral videos of all time, “Charlie Bit My Finger,” courtesy of quietube. For the Twitter community and others concerned with URL length, you can click the link entitled “TinyURL for this page” and be taken to TinyURL which will deliver you an even shorter link to the same video. So for the TinyURL afficionados, you can check out the example video here. This entry was posted in Good: Amazingly slick designs!, Internet Safety by knutson. Bookmark the permalink. thanks for the post on this. As someone who has frequently been annoyed by the overwhelmingly low signal-to-noise ratio on youtube, this will make it much less obnoxious. Brilliantly simple. I wonder what other sharable resources could be repackaged in clean and simple way?